How to charge your phone using mud Jump to media player Small generators that use heat to make electricity have gone on trial in parts of Malawi where only 10% of the population has access to power. Malawi's life-saving stoves Jump to media player Could a humble cookstove save children's lives? Inside Morocco's giant solar plant Jump to media player A giant solar plant will open in Morocco next month, which will use salt to continue to provide power when the sun has gone down. 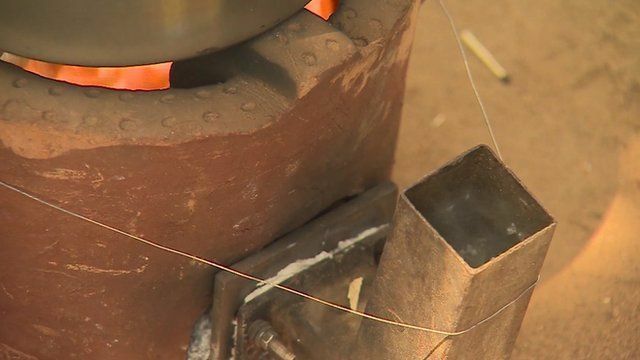 Small generators that use heat to make electricity have gone on trial in parts of Malawi where only 10% of the population has access to power. The device - called a thermo-electric generator - gets attached to a mud oven so people can charge up a torch, phone or radio as they cook their food. The project is funded by British and Irish Aid. To hear more about this and other similar projects listen to Changing Climate on BBC Radio 4.